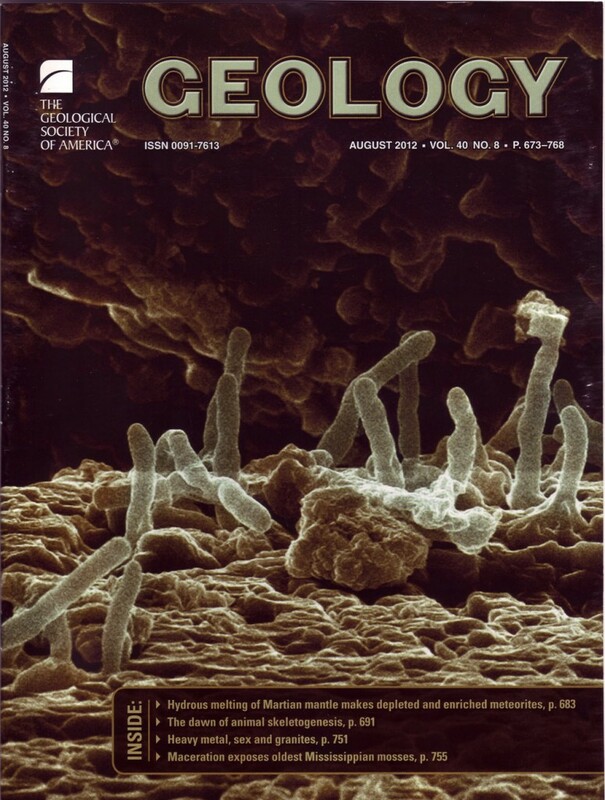 On the Cover: Scanning electron micrograph of microbial fossils (blue-green false color, against a false sepia color background) identified in the iron-rich rind of concretions found in the Jurassic Navajo Sandstone of south-central Utah (United States). Microbial structures measure >0.5 mm wide and range from 2 to 5 mm long. Karrie A. Weber, Trisha L. Spanbauer, David Wacey, Matthew R. Kilburn, David B. Loope and Richard M. Kettler. August 2012. Biosignatures link microorganisms to iron mineralization in a paleoaquifer. Geology 40(8), pp. 747-750. Karrie Weber is assistant professor of geomicrobiology and microbial biogeochemistry in the Department of Earth and Atmospheric Sciences and assistant professor of biological sciences. David Loope is Othmer/Schultz Professor of Stratigraphy and Richard Kettler is associate professor, both in the Department of Earth and Atmospheric Sciences. Trisha Spanbauer is a doctoral student in earth and atmospheric sciences. Joel Brehm is graphic designer in the Office of Research and Economic Development.